The Koopa Cannon is a machine found on Baby Bowser's Koopa Cruiser in Mario & Luigi: Partners in Time. 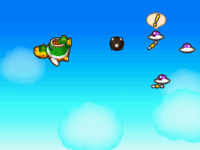 When Princess Peach's Castle is under attack, Kamek uses this weapon to blast away the Shroob UFO. Later, it is used by Baby Bowser to defeat more Shroob UFOs. He also has to use it to blast away some Shroobs. Later, Baby Bowser uses it to destroy the incoming Shroob Missile. However, he overuses it, and everyone on board plummets down to Baby Bowser's Castle. This page was last edited on February 24, 2018, at 12:26.